No need to break out the bubble gum ball machine! 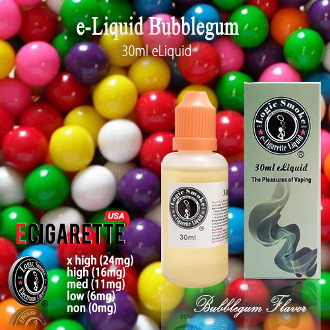 Vape our bubble gum flavored e cigarette liquid and flash back to your childhood. A minty sweet, yummy all-time favorite flavor! And you will get voluptuous clouds of sweet vapor instead of bubbles and guess what? No gum in your hair! Try it out today and enjoy in your favorite e-cigarette device. You will love it! With the perfect blend of an 80/20 PG/VG mix (propylene glycol and vegetable glycerin: organic, food grade preservative compounds), you'll get the best e cigarette liquid flavor concentration along with the perfect amount of vapor to satisfy your vaping needs.